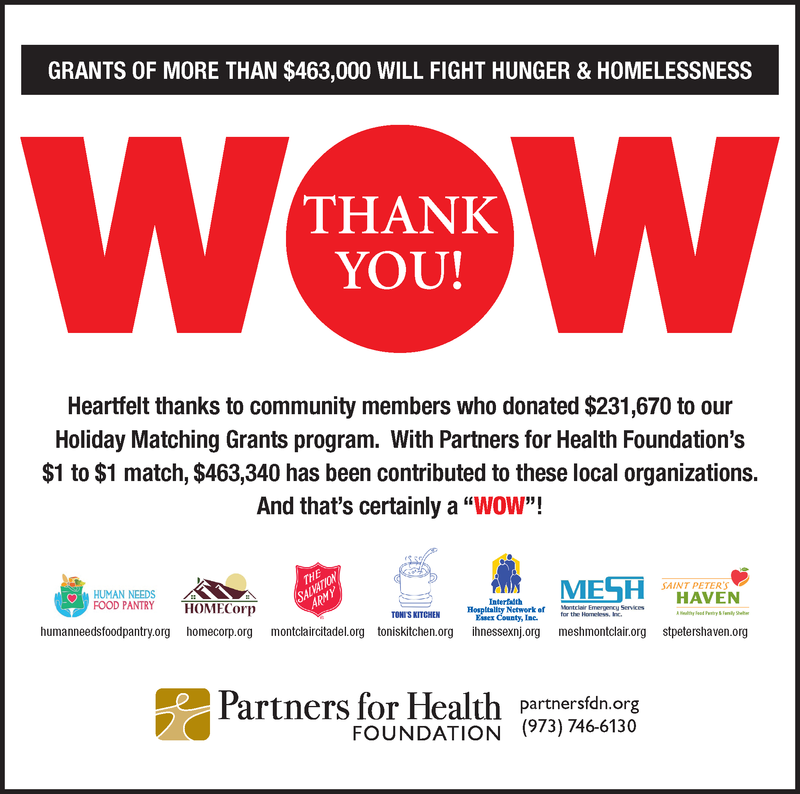 More than 400 community members opened their hearts and wallets during the 2016 holiday season, donating $231,670 to the Matching Grants Program sponsored by Partners for Health Foundation. With the Foundation’s $1 to $1 match, grants totaling $463,340 were made to seven local soup kitchens, food pantries and agencies that provide services to the homeless and those at risk of homelessness. 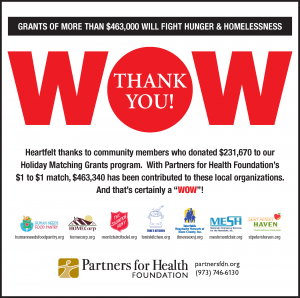 Matching grants were distributed in Montclair to the Human Needs Food Pantry, Toni’s Kitchen, Salvation Army, HOMECorp, Interfaith Hospitality Network, and Montclair Emergency Services for the Homeless (MESH). St. Peter’s Haven in Clifton also received a grant. “In 2015, Toni’s Kitchen provided 52,000 meals in our community. In 2016, we provided almost 70,000. We cannot meet this increasing need without these funds. Our soup kitchen had fresh produce at every one of our meals. This builds habits of health, especially for children. Over time, behaviors are changed and habits are developed. The benefits will last a lifetime,” said Anne Mernin, Director of Outreach at Toni’s Kitchen. “The St. Peter’s Haven Healthy Food Pantry serves about 850 people each month and 10-15 people in our Transitional Shelter for Homeless Families. This grant will support outreach efforts to children and seniors who qualify for services,” added Fr. Peter De Franco, Executive Director.